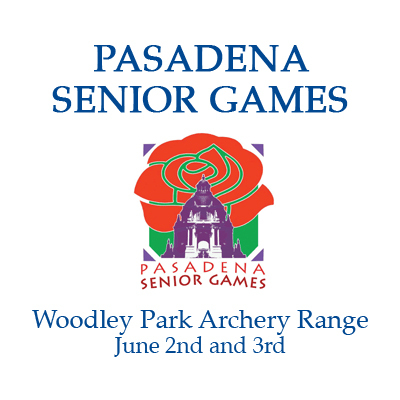 The Senior Games are coming to Woodley Park Archery Range on June 2nd and 3rd! Hosted by Susie and Oscar Sanchez for the Pasadena Senior Center, there will be a 300 Round* at the short range on Saturday, June 2. It begins at 1:00. On Sunday, there will be a 900 Round** on the long range. The 900 Round begins at 9:00 AM. Please arrive at the range well before the start times. We want to be sure that you have plenty of time to park, set up and check in BEFORE we start shooting. Bring your equipment, chairs and shade. Lunch will be provided on Sunday only. It is helpful to pre-register, but walk-ons will be welcome. *The 300 Round consists of 10 ends of 3 arrows each at 20 yards (18 meters) using a 40-cm face. The faces may be either a single target or a 3-spot. *The 900 Round consists of 30 arrows each at 60, 50 and 40 yards using the standard 122-cm FITA face. There are five, 6-arrow ends at each distance.